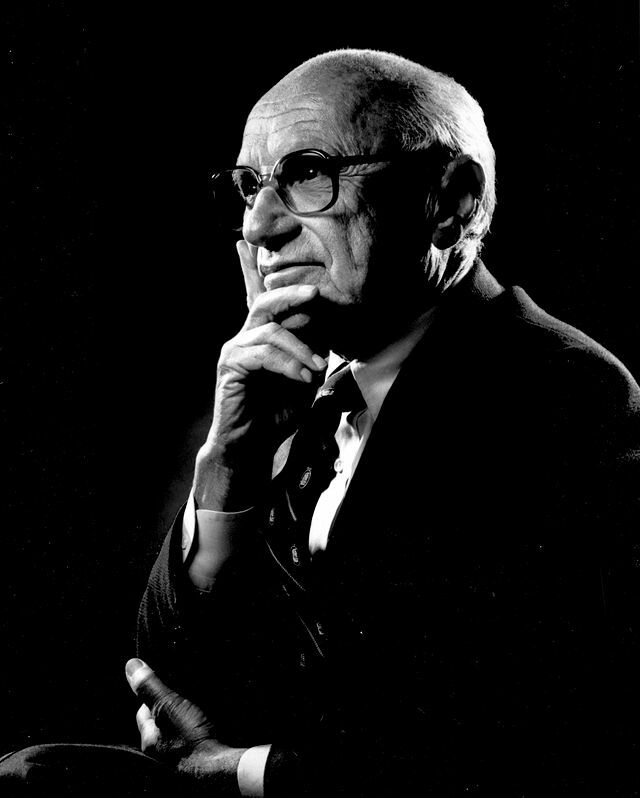 US economist Milton Friedman coined the term “Miracle of Chile” to describe the economic success which came from free market reforms during the 1980s and ’90s. 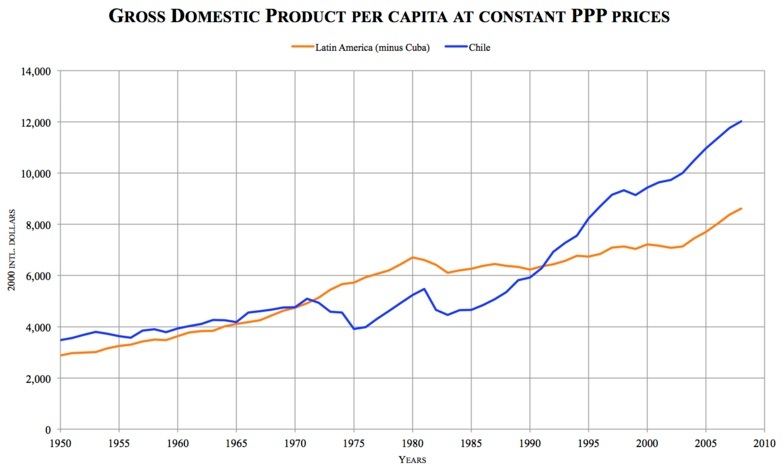 Before the reforms were implemented, the country had suffered through bread lines, hyperinflation of 700 percent, and falling income per person under the three years of Marxist policies of Salvador Allende. The drastic failure of those socialist policies, and contrasting growth due to market reforms are remarkably visible in the simple graphic below. While the “Economic Miracle” of Chile is often tied to the Dictator Augusto Pinochet, the program and ideas which contributed to the stabilization and rapid growth of Chile’s economy began independently, roughly 20 years before Pinochet even considered taking control of the country. The famous “Chicago Boys,” who were the brains behind the reforms, were the result of a partnership between institutions in the United States, and Chile. Specifically, in 1956 the Universidad Católica agreed to a collaboration with the University of Chicago to initiate what would become known as the “Chile Project.” The program was eventually shared through partnerships in Argentina, Brazil and Mexico as well nine years later. In 1970, the fruits of the program began to have an impact on Chilean political discourse, and the first prominent politician to support the ideas cultivated by the Chicago Boys was Jorge Alessandri. Having been Chile’s 27th president, Alessandri was representing the political right again during the election of 1970. A 500-page plan cultivated by the Chicago Boys appropriately known as “the brick” (El Ladrillo) was presented as part of Alessandri’s economic platform as a solution to Chile’s in an attempt to reform Chile’s economy. The election would see leftist socialist Salvador Allende placed at the head of the country. After the 1973 Chilean coup d’état, the ruling “Junta” was faced with a drastically starved and collapsing economy and inflation had reached an estimated 1000%. While it is true that Pinochet’s administration was used as a vehicle to implement the economic policies and ideas which have lead to Chile being a financial center of South America, and one of the soundest economies in the hemisphere, Pinochet himself was neither the architect, nor primary proponent of the policies. The independence and success of the economic reforms in Chile can be observed by the fact that they have remained largely unchanged after 24 years of democratic rule in Chile since his administration. Much of the success of the plan could be credited to the simplistic clarity of the solutions implemented. The main objectives of the plan could be defined as privatization of inefficient socialized institutions, liberalization of previously restrictive and prohibitive economic regulations, and a stabilization of crippling and rampant inflation. While Chilean administrations in the 1990s focused on reducing a staggering impoverished class, much of the social immobility throughout the economy had been caused by the caustic policies of the Allende administration, and socialist policies leading up to his administration. Efforts to reduce poverty in Chile have been very successful, and have dropped from 48% of Chileans living below the poverty line in 1988, to just %20 in 2000. In 2010, the results of these market reforms culminated with Chile becoming the first nation in all of South America to win membership in the Organization of Economic Cooperation and Development which is restricted to the world’s richest countries. Chile currently enjoys one highest economic freedom rankings in the world.